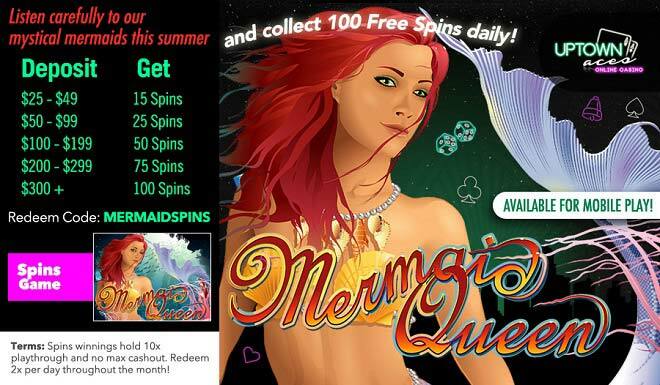 Mythical 100 Free Daily Mermaid Spins! If you ever dreamt of becoming a mermaid – or at the very least, you’ve always wanted to spend some time with one – you’ve got your chance this summer Uptown! With your deposits of as low as $25 you’ll be hanging out with the Mermaid Queen herself, twice per day throughout July! Spin the reels of the Mermaid Queen slot where the Mermaid symbol works as a substitute for any other icon in any winning combination, except scattered Clams. When the Mermaid symbols appear anywhere on reels 1, 2 and 3, you’ll be collecting up to 10 extra spins! Transform into a mermaid lover this July when you play with Uptown’s most mythical Free Spins of the year!